The Autotask Importer will bring over your data from Autotask to Syncro as historical data, and you will be able to view the info in your Syncro account. 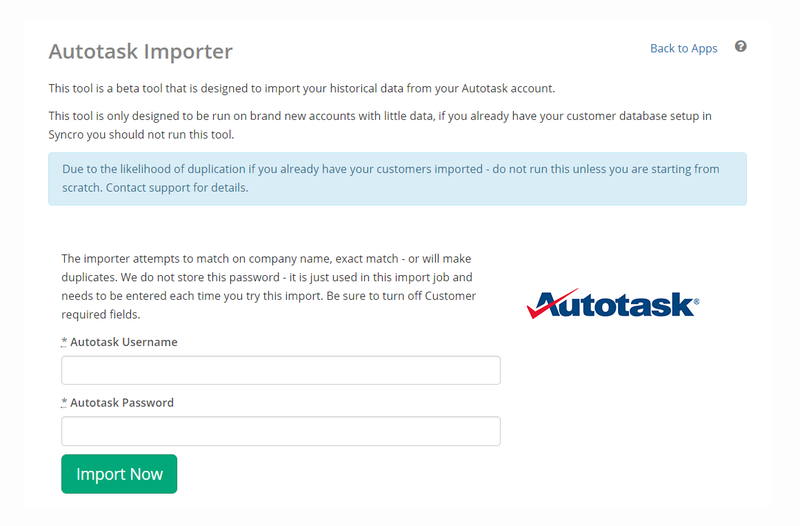 The importer is currently in beta, and you will need to enter in your Autotask credentials to import your data. We do not store these credentials, and they will need to be entered any time the tool is used. This tool will import your data based on the company name. It will create duplicates if the data is not an exact match, so it is recommended to not run this tool if you already have Customer data in Syncro. Note: If you do not see the Username/Password fields your account likely has enough data that the importer may create duplicates. Contact support to learn more.